Within minutes, 30 million people were in the dark. 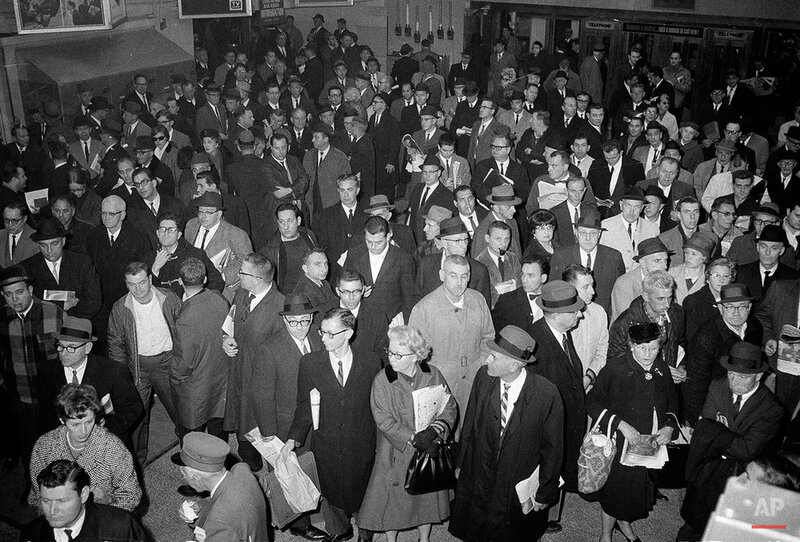 A power failure originating at a Canadian station near Niagara Falls spread the evening of Nov. 9, 1965, leaving most of the Northeast U.S. and parts of Canada without power for hours. At its peak, the outage covered 80,000 square miles. In New York City, the plunge into powerlessness came at 5:27 p.m., at the height of the evening commute, trapping hundreds of thousands of subway riders in their train cars, stranding others in building elevators, wreaking havoc with traffic and forcing airplanes to divert. Grand Central Station became an ad-hoc bedroom for commuters who couldn't get home. For most of New York City, the brightest light available was that of the moon. Largely, though, people remained calm, stepping in to help where they could, such as directing traffic. Hospitals were able to use generators to keep functioning. Over the next few hours, power came back — in Canada by 8 p.m., upstate New York by 9 p.m., Massachusetts by 10 p.m.
New York City waited the longest, with power starting to come back around 3:30 a.m. Nov. 10. Here is a gallery of images from that night. Text from the AP news story, AP PHOTOS: Blackout of 1965 Plunged 30 Million into Darkness.